Driving to my hotel from the Minneapolis airport for a Winnebago employee deposition case, I arrived in northern Iowa and checked in. At the time I vaguely noticed a framed newspaper article hanging on the wall next to the counter. After unpacking, I went back down to the restaurant for dinner before settling in for the night and on my way I stopped to look at that newspaper article again. I smiled again as it played in my mind, walking to the restaurant for dinner. Later last night, my cousin in Florida, emailed the family with a link to a YouTube video titled “Meaning of American Pie by Don McLean,“ where someone had mixed images into the song to create a video that showed all of the images that the lyrics were based on. I had no idea how this song encapsulated all of the images and memories from the days of Buddy Holly through the 1960s and ’70s. AND THERE IN THE VIDEO was the front page of the local newspaper in a town just a few miles away from my hotel. Pictures of the crash site. Rock and roll history. I had no idea how close I was. When the deposition was over I got out my iPhone and Google Maps on a hunch and simply typed in “where the music died.” Up popped a black round target just a few miles north of me. I drove out, one left turn, one right turn and straight ahead a couple of miles and there it was, the huge black-framed eyeglass rims mounted next to the road to mark the spot where two cornfields were separated by a fence running into the distance. Three-fourths mile or maybe one mile off the road, down the fence line, was the memorial at the crash site. A couple joined me from the road: He was from Germany and she was from Spain – sixty years later and they knew the song, too. Now I sit in my hotel near the airport in Minneapolis, listening to the music, thankful that my cousin sent an email about the day the music died. If he had not, I would not have known how close I was to the iconic crash site of three rock ‘n’ roll legends. It would have been just another deposition in another state. Ron Burdge is America’s best-known RV lemon law attorney. You can reach him at his website RVlemonLaw.com. 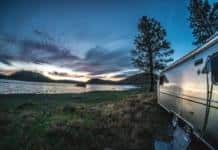 Previous articleBuilding an RV park from scratch: We met the neighbors! Next articleDo you need an external spare tire cover? Just did a DuckDuckGo search and this article was the 3rd listed. Great song. Thanks for sharing. Thanks! Now I know more about the times I’ve lived through. Very emotional…brought back many memories…life goes on. Thank you for the trip back in time. Music has always been an important part of my life and my older brother loved his 45’s. I was nine at the time and have a vague recollection of the event. A few years ago, we owned an Itasca motor home and we went to Forest City for some repairs. While we waited during the days of the repair, we visited the Surf Club in Clear Lake, the last place they played. We also visited the corn field. I think I found out about it similarly to the way the author did. Wow, That brings back some old memories! THANKS for sharing those memories, gone but never forgotten. I remember the day the plane crash was announced on the radio! I was 14 years old.